I thought I'd etch out the basics of the 2019 regulations for you, as Michael Schmidt (AMuS) has managed to cast his eyes over a preview of the regulations that were passed on Monday. 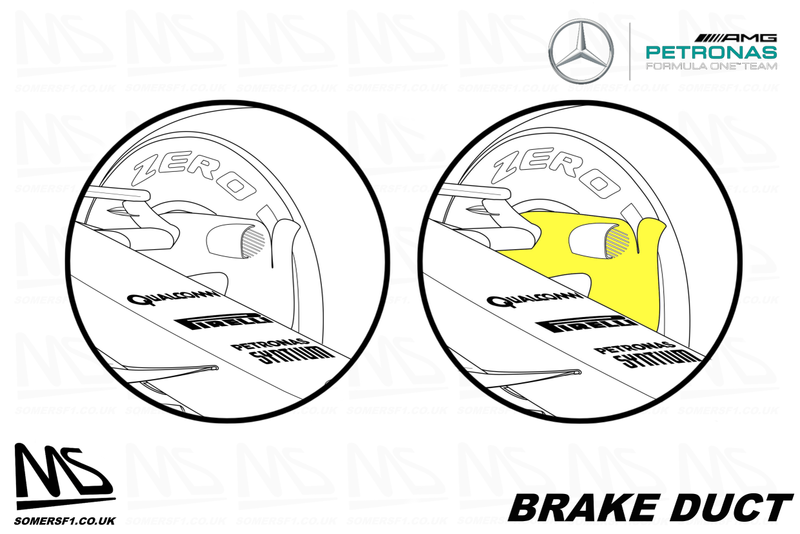 Brake ducts simplified, with the various winglets hung from the vertical fence done away with, whilst flow through aero such as the blown axle will also be ruled out. A wider, deeper rear wing which will not only balance the downforce available at the front of the car but also boost straightline speed when DRS is active. Bargeboards can extend 10mm further forward but are reduced in their height capacity by 15mm. 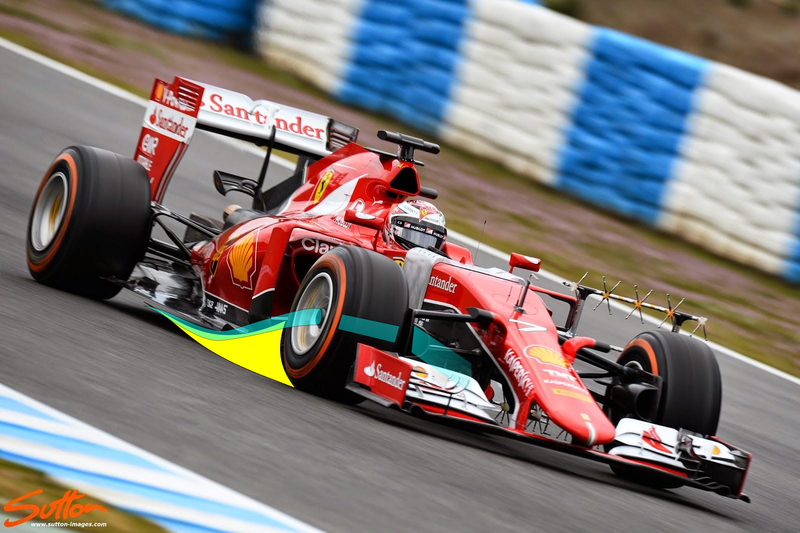 The exhaust will sit further back in order to further limit the practice of blowing the underside of the wing. So, what's the skinny? Why are these changes being made? What's actually changing and how will it look? It's the front wing that will change the most for 2019, not only from an aerodynamic point of view but also an aesthetic one. Perhaps the most least noticible visual, but perhaps the most important aspect (as it'll help to balance the changes the rear, more on this later) are the dimensional shackles that are being taken off the designers. 100mm wider (50mm either side), taking the wing up to 1900mm, rather than 1800mm. The outwash potential of the endplate will also be lessened, as its box area is reduced from 90mm to 50mm (3.3.4), meaning it will no longer be able to be as aggressively outturned. Further design limits are expected to be placed on their shape too. 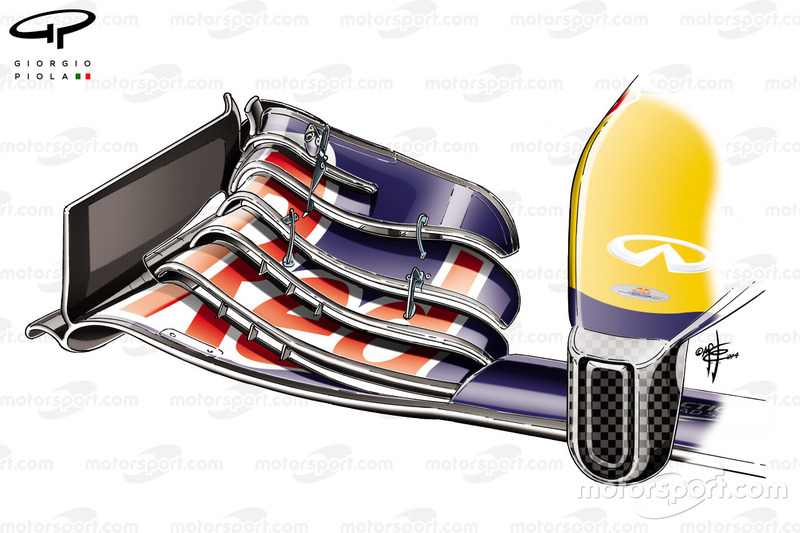 All of the upper furniture, used to create vortical structures will be stripped away too, as the designers lose the ability to use stacked cascades, endplate canards and other vanes (highlighted in red on the FIA drawing above). As an idea of the sort of wing we may get used to seeing, here's Giorgio Piola's fantastic illustration of Red Bull's cascadeless front wing used in 2014 at Monza. The amount of winglets and the shape of the brake ducts vertical fence has changed dramitically in recent years, as the designers look to introduce vortices that will enforce ones already created by the front wing and/or generate new vortical structures that improve the wake shed by the front tyre. The 2019 regulations look to simplify this by stripping away all of the winglets and reigning in the design freedom enjoyed by the designers. The vertical fence used to shape the airflow will also be constrained more, limiting its geometry and any slots that may currently feature. Closed channel aerodynamic solutions, such as crossover pipes and blown axles will also be outlawed, meaning turbulent airflow created by the wheel rim will also go unchecked. As such, the brake ducts will only serve their primary purpose of cooling the brakes. The scope available for change in the regulations at the rear of the car is much more limited - dimensionally. 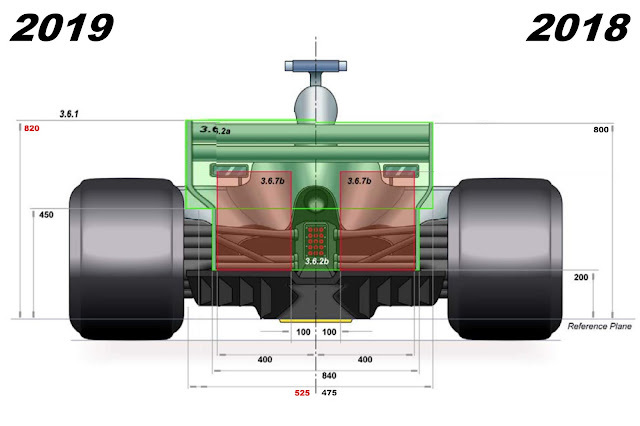 However, to balance their efforts at the front the FIA will instruct designers they have 20mm more play in terms of height (up to 820mm) and the width is increased to 1050mm, matching the diffuser below. 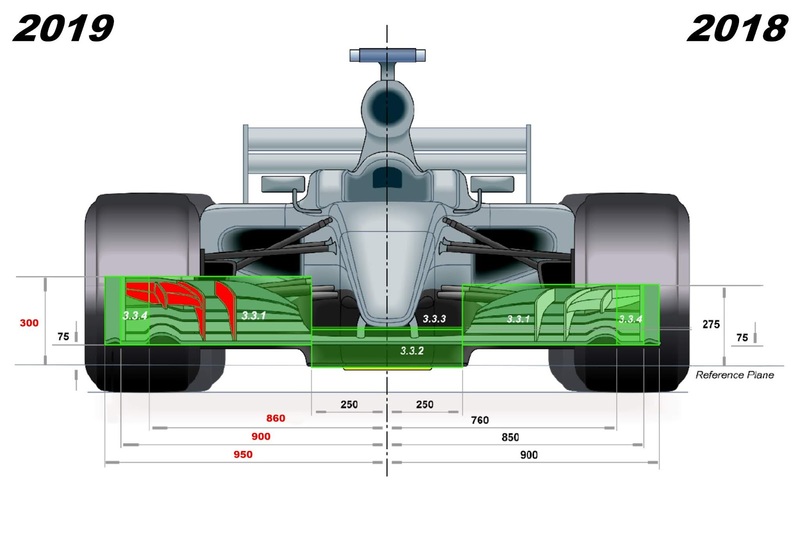 This not only gives more surface area with which to create downforce but also changes the ratio of the mainplane and top flap, increasing the strength of DRS. Also off the menu are endplate louvres, these improve the efficiency of the wing by bleeding low pressure airflow into the high pressure region, altering the shape of the vortex formed at the wingtip. It's a trick that Formula One teams have been using for over a decade and has more recently seen the use of these open-end style louvres, pioneered by Toro Rosso and seen here on the Mercedes. So, what's the upshot of these changes? We're adding drag and in spades. 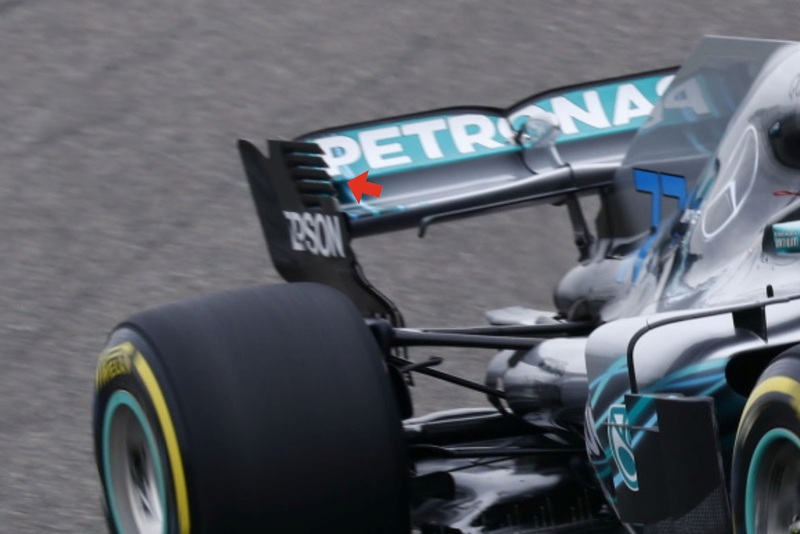 The cluster of devices used to create vortices on the front wing may bring drag in their own right but the way they work together in bulk to reduce the high pressure created on the front tyre is actually more significant. Their role in reshaping the wake aft of the wheel assembly cannot be overlooked either, as untreated it'll have an impact on the performance of the floor - likely resulting in even more complex structures around the front of the sidepod and floor to compensate. The upshot is I expect cornering speeds to continue climbing (as downforce can be added) but straightline speed will inevitably suffer. Of course this should come with the added benefit of allowing the trailing car to stay in touch during cornering but offer an enhanced slipstream effect when on the straight. I wait to see what happens by increasing the effect of DRS and suspect the zones might end up becoming a little shorter. All in all it's a positive step by the sport, as it looks to make improvements ahead of the widesweeping changes due in 2021. However, I guard against getting too excited, 2009 was supposed to bring us great wheel-to-wheel racing, with the OWG having spent time adjusting the rules to improve overtaking. A decade on and this is yet another in a long line of kneejerk reactions and bandaid solutions designed to improve the spectacle. Furthermore, I may not have an actual copy of the regulations yet but that hasn't stopped me imagining ways around the aformentioned changes, so, just imagine where the teams are with it already. If you liked this post or my content in general please support me via Patreon, as it appeared there first 3 days ago. Patrons generally get early access and patron only content from as little as $1 per month.